What's the best way to get from Beijing to the Mutianyu Great Wall of China? We hired a private car and driver through Wild Great Wall. We visited the Mutianyu Great Wall of China on a day trip from Beijing during the Silk Road Summit (also known as the Belt and Road Forum). Meant to support China's efforts to revitalize trade in countries along the historic Silk Road, China's President Xi Jinping pulled out all the stops for visiting VIPs like Russia's Vladimir Putin. The Chinese government mandated factories in the region to shut down and there were bright blue skies over Beijing (something that never happens naturally according to locals and other bloggers I know who have visited). I like to think that Xi Jinping was rolling out the red carpet for Sidewalk Safari too during the Belt and Road Initiative :-) We couldn't believe our lucky timing for our visit to Beijing. We definitely felt like visiting VIPs during our visit to the Mutianyu Great Wall. 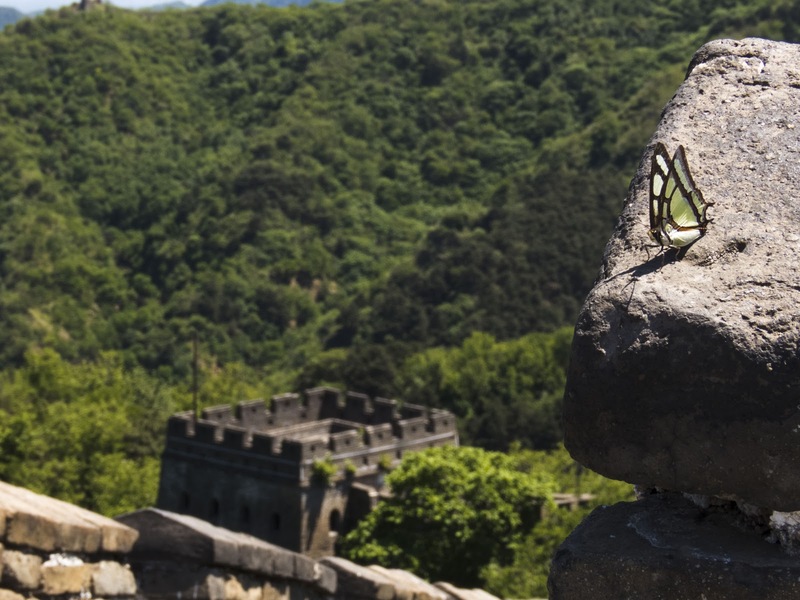 We first read about Wild Great Wall from our friend Alex and Bell at Wanderlust Marriage. 690 RMB (about $100 USD at the time of writing) buys a half day with a non-English speaking driver in a clean, mid-sized car. Communication was difficult but we did fine with our driver's translate app and the occasional quick call to Ricky whose English was very good. 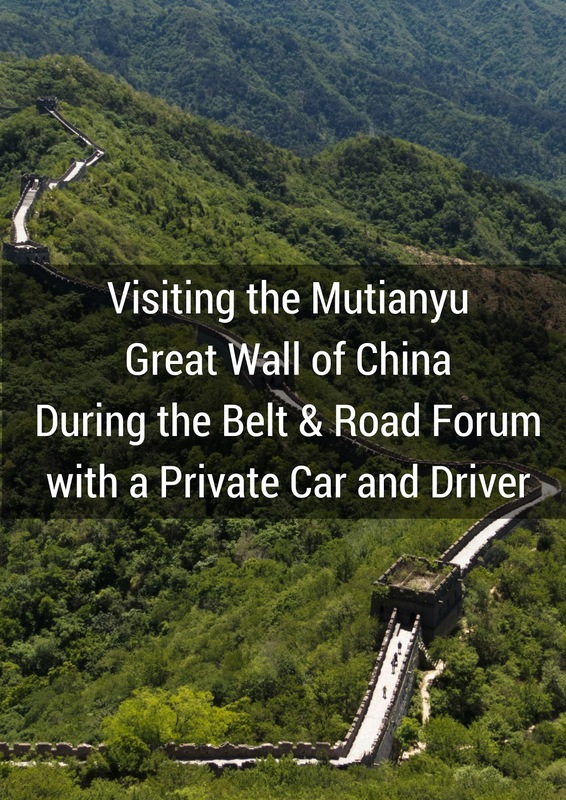 The cost includes Beijing city hotel pick up / drop off, our Chinese speaking driver, a 4-seat air-conditioned car, and the visit to Mutianyu, including parking, gas, and toll fees. The cost doesn't include entrance fees, transportation up and down from the wall itself or meals. Wild Great Wall also promises that there will be no factory / shopping stop, no hidden costs, and a quality time at the attraction. We were pleased with the transparency of communication and that we knew what lay in store for the day. 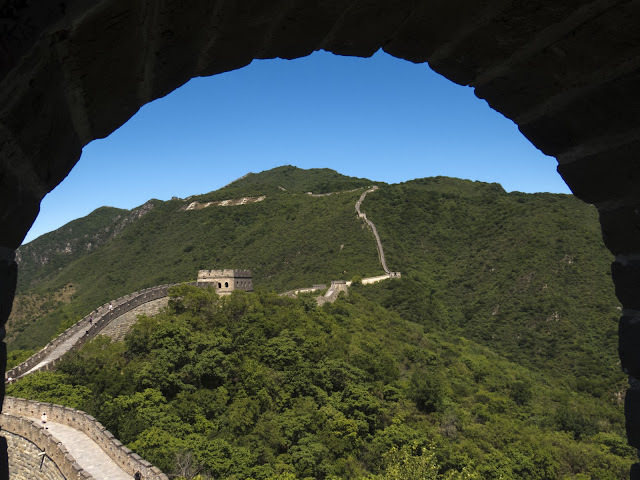 SIDEWALK SAFARI SPOTLIGHT: A private car and driver is the way to go to see the Great Wall of China but did you know that you can easily get around Beijing on public transportation? Our Wild Great Wall driver picked us up at the Marriott City Wall Hotel at 7:30 am. The goal was to beat the morning commute traffic out of Beijing. Apparently, in addition to beautiful blue skies, the Belt and Road Forum had unintended consequences. With all the visiting dignitaries, the Chinese government instituted a series of unannounced road closures in the center of Beijing. 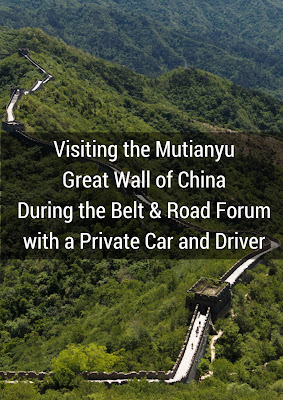 The drive to the Mutianyu section of the Great Wall of China normally takes 90 minutes. After 45 minutes of snaking in and out with our driver trying to find every possible short cut, we could still see our hotel. We finally positioned ourselves on one of the main ring roads pointed out of Beijing and were creeping along in a traffic jam. I'll admit, we were disheartened at this point. If things continued this way, it would be late afternoon before we made it to the Mutianyu Great Wall. We told the driver using his translate app that we thought we should cancel and try again tomorrow. If he could just drop us off at a metro station, we'd find our way back to the city center. Our driver then gave us what I can only describe as a pep talk via his translate app. He assured us that the worst of the traffic due to the Belt and Road Forum was behind us, this was now just regular commuter traffic, and that we were almost through it. If we could just hang on a little longer, we'd soon be enjoying ourselves and having an amazing experience at the Great Wall. In the end, we were so glad that he convinced us to hang in there! It took 3 hours to reach the Mutianyu Great Wall (about double the usual time). The Mutianyu section of the Great Wall of China is elevated relative to the roads below. There are three ways to get up the wall: take a 45 minute uphill walk, ride a chair lift, or take the cable car. We heard from other bloggers that the 45 minute walk is grueling and that by the time you do that, you don't have any energy left to walk on the wall itself. That left us with the chair lift or cable car. I don't like heights and the chair lift is one of those exposed ski lift type arrangements. We paid about 100 RMB to ride the enclosed cable car up to the great wall. We were whisked to the top and enjoyed 10 minutes of stunning views on the way. Having the Mutianyu Great Wall Nearly to Ourselves! The cable car takes tourists up to Tower 14. We stepped onto the wall and the thing that surprised me the most was that I couldn't see another person. We practically had the Mutianyu Great Wall to ourselves. Apparently other tourists were either disheartened or delayed in getting to the Great Wall today. I was really glad at this point that our Wild Great Wall driver had convinced us to persevere with our road trip to the Great Wall that day! We were really glad that we heeded advice and took the cable car up. The Mutianyu Great Wall snakes up and downhill and the walk on the wall itself was tiring, especially since it was very warm when we visited and there is not a lot of shade during the walk. There are 24 towers comprising the Mutianyu section of the Great Wall. The towers were a great spot to cool off in the shade. We were concerned that the Mutianyu Great Wall would be covered in tourist tack with aggressive vendors trying to make a few yuan. I'm pleased to say that our fears were unfounded. There were no vendors at all on the wall itself. We did discover that a few Great Wall entrepreneurs had set up shop in the towers. Here they sold bottled water, sodas, and snacks to unprepared visitors for steeply marked up prices. Come prepared with plenty of bottled water and snacks. There aren't many opportunities to buy more at the Great Wall and the vendors that are there charge 5-10 times what you would see at a retail shop in Beijing. I laughed out loud when one vendor offered me a Coke for 60 RMB (about 10 USD at the time of writing)! We walked from Tower 14 to Tower 24 in about an hour. This included plenty of photo stops. To reach the end of the Mutianyu Great Wall (at least the end as far as accessibility by tourists is concerned), we had to climb an incredibly steep staircase. We huffed and puffed our way to the top fighting vertigo along the way. The views from this vantage point were simply stunning. As we walked at a leisurely pace from Tower 24 to Tower 6, we encountered some entertaining translations along the way. Glass ladder rank, carefully slip and thus went down the mountain were two of my favorites. There is definitely work to do on app and human-based translations between dialects of Chinese and English. In most cases, we could get the gist of what they meant: "thus went down the mountain" = "the toboggan is this way". For another 100 RMB, we opted to save time and take the toboggan ride down from the wall. We were seated in one person toboggans equipped with a hand brake and sent careening down a metal track. I thought it might be quite scary but in reality the toboggans didn't go that fast and the speed was controllable with the brake. This was the sort of over-the-top fun that I feared might ruin the experience at the Mutianyu Great Wall. We were impressed with the lengths went to to preserve the ancient look and feel. It's only outside the wall and well-hidden from view that modern conveyances and tourist tack can be seen. 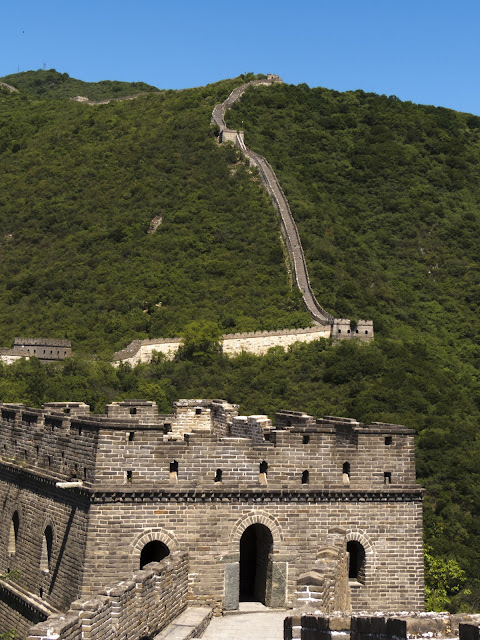 Have you visited the Great Wall of China? What section did you visit? How did you get there? How was your experience? Leave a comment and let us know! Disclaimer: Wild Great Wall gave us a half price discount on our tour in exchange for a post/review. However, the views expressed here are entirely my own. 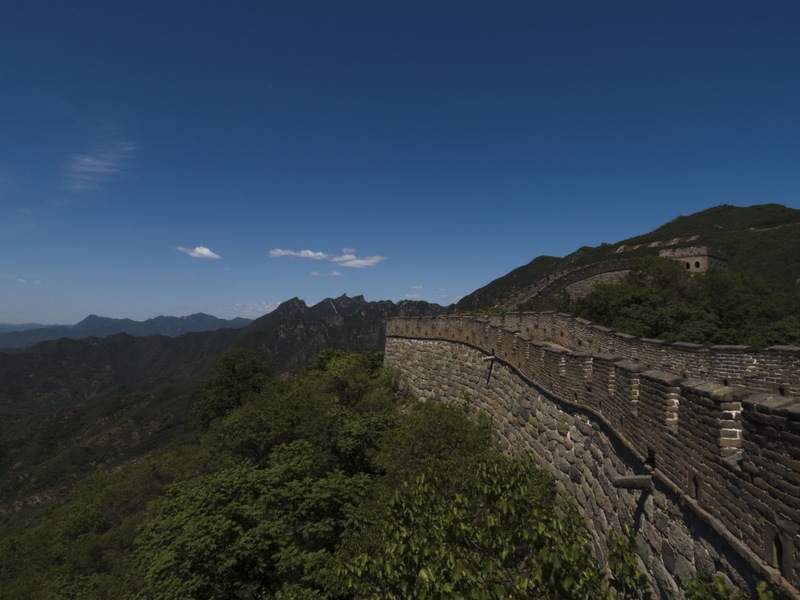 Travel from Beijing to the Mutianyu Great Wall of China with a private car and driver. 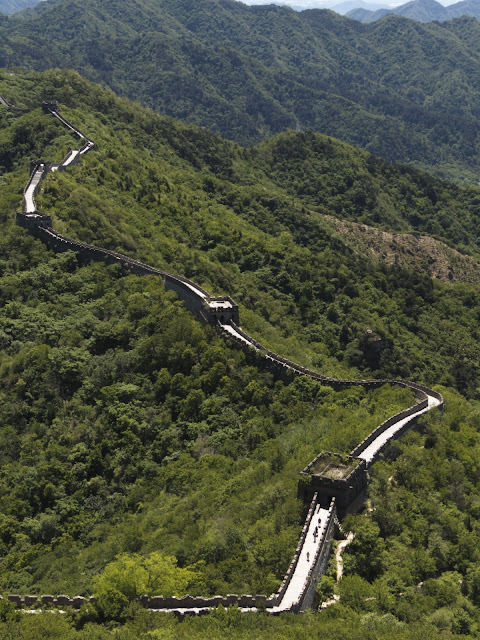 Take the Mutianyu Great Wall cable car to the top and explore the Great Wall of China on foot. Return to the entrance on the Mutianyu toboggan.